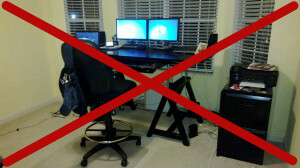 Stand Up Desk | brian habbe | life ..
Last week I moved the desk back down to the standard height. The keyboard being to low when standing up and not being able to get the chair high enough if the keyboard was on top of the desk was causing a problem. It was a good try.